Finally, someone has done dehydrated oranges right. It’s been awhile since I’ve reviewed any dehydrated fruit. 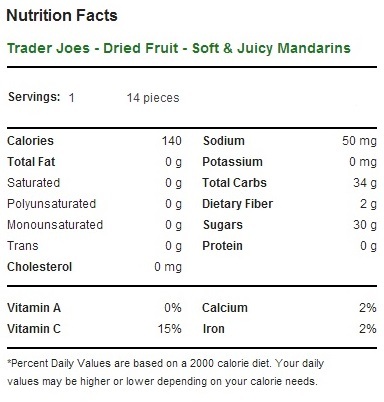 On the one hand, this is surprising because Trader Joe’s has more dried fruit than a mountain man’s cabin. Seriously, whenever I walk into the fruit and nut section of my local TJ’s I feel like I could be standing in a rustic general store in some picturesque moutain town that probably only exists in the movies. On the other hand, this is not surprising, because all dehydrated fruit more or less tastes the same. Trader Joe’s apricots taste basically just like the dried apricots you’re going to get anywhere else. Thus I tend to limit my dried fruit selections to truly unusual offerings – like vacuum fried banana chips – or precious, precious mango. For that very reason, I’ve long avoided the winking gaze of Trader Joe’s Soft and Juicy Manadrin Slices. Pretty much I felt I was capable of guessing what these were going to taste like, and if that’s the case, why the hell would I need to bother with reviewing it. Finally, after about of year of seeing these sitting lamely in the “New!” section, I bit. Boy howdy, I’m glad I did. If you’ve had dehydrated oranges before, they probably rank among your least favorite dehydrated fruits. Usually a slice of dehydrated orange becomes something like a desicate flap of leathery skin, and tends to adhere itself to your teeth the moment you take a bite. Not so here. These slice are every bit as soft and juicy as they are set up to be. Not only are they piable, chewy and soft, but they’re amazing flavor and sweet to boot. Now make no mistake, there is added sugar here, but it’s the natural brilliant orange flavor of these mandarin slices that really shines through. I know that doesn’t sound like anything too special, but believe me when I say the first one of these you try is going to make you sit up in your chair. It’s hard to believe that they did it, but Trader Joe’s has really managed to capture that juicy, citric zing and sweet, warm flavor of perfectly ripe oranges. The thing that really impresses me about these sugared, sulfured orange slice though, is just how damn healthy they are. The serving size is a generous 14 slices, for a total of 140 calories. That’s right – only 10 calories per plump slice of sweet, natural orange flavor. I’m well aware that the most cliched thing I could say right now is these orange slices are nature’s candy, but dammit these orange slices are nature’s candy. In fact, they’re better than candy. If you sat a bag of these delicious little orange slice in front of me, and a bag of stupid Skittles or something, I’d go for the dehydrated orange slices every time – they’re really that good. Just how does Trader Joe’s manage to deliver such plump and juicy dehydrated fruit slices? Isn’t dehydration supposed to result in the exact opposite of that? Ggodo question – the answer is sulfur dioxide, that handy preservative that locks in the flavor and color of dried fruit. This is the very same sulfur that is being referenced when a dried fruit product boasts of being “unsulfured” – generally also identifiably by the dead brown color that tends to be the result of the sulfuring process. Without a doubt, if these mandarin slices were unsulfured they wouldn’t taste half so tangy and sweet. If sulfur dioxide is so helpful, why don’t we just sulfur all our fruit, you may well be asking. The answer, of course, is that people have a tendency to dislike preservatives in their food, especially in something so primal as dried fruit – hence the variety. Generally, I go for unsulfured fruit myself, but when the results are as delicous as these mandarins, I have no qualms about sulfuring the hell out of them. I recommend you give them a taste and see if you agree with me. Would I Recommend Them: I already have. Would I Buy Them Again: Yes, I’ll go for these next time my sweet tooth demands a sacrifice. Final Synopsis: Dehydrated mandarin slices are nature’s candy. My daughter was recently diagnosed with Celiac Disease, so she’s now 100% gluten free. Are these considered Gluten Free by USFDA standards? I’m glad your daughter got diagnosed Amilia. I’m not an expert when it comes to gluten in Trader Joe’s products. Are these still available? I’ve tried to find them in several NYC stores, but they no longer seem to be stocked. I just found these a couple of weeks ago and have gone through two bags already and have another that I’m about to open. They are amazing! Definitely the best dried fruit that I’ve ever had. If you can’t find them in stores near you, they do have them online at Amazon. I have seen these before and eyed them suspiciously. I, too, have not had good run-ins with dried citrus. 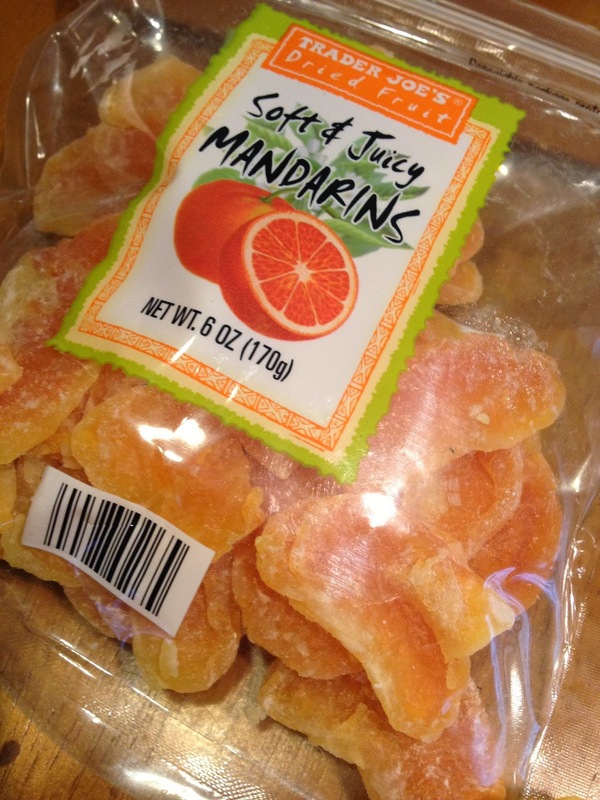 However, I do love the flavor of mandarins, and if Trader Joe’s has managed to capture and package that up for me, then I will stop resisting. Going to see if I can pick some up tomorrow. Thank you for convincing me to take the plunge! These are everything you described and more. And there’s a fat lot of stock in Los Angeles stores.